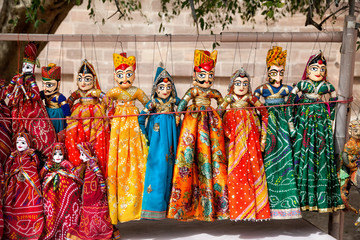 The marionette art of Kathputli from Rajasthan is fading to the hands of modern art forms and sources of entertainment in India. Interestingly though, these wooden dolls are staging shows for audiences abroad. What is puppetry all about? Mere mention of Rajasthan paints a very colourful and vibrant image in minds. It is a state synonymous to colours, arts, traditions, music, and cultures. Kathputli- the art of string puppetry, is one of the many fascinating facets of this northern state. Entertaining the world since time immemorial the art of Kathputli (Kath= wood; putli= a lifeless doll) has a unique story to it. It is said to have been founded by the nomadic Bhat and Nat tribes of Rajasthan, which used to travel and perform across the country. Kathputli has even been mentioned in the folk lore and mythological stories from states other than Rajasthan, solidifying the importance that it holds. 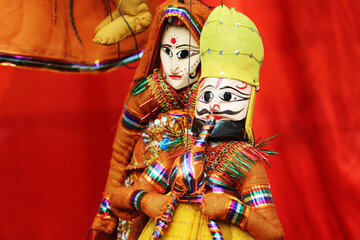 Kathputlis typically have wooden torso and shoulders while the legs (absent in the ones based on a female character) and arms are made of clothes stuffed with cotton. These flamboyant dolls are controlled by the artist via the strings attached to them and moved in an agile fashion. The story is narrated in a musical manner using traditional musical instruments such as dholak, ghungroo, and boli among others. The theatrical set up includes a tambudi (tent) supported by bamboo poles or two lightweight cots put up lengthwise. It is upon this framework that decorative curtains and backdrops are rested, behind which the puppeteer or the artists is present. J D Bhatt, a Kathputli artist, who is following his family lineage of performing this marionette art, shares with Media India Group his experiences and ideas on puppetry in today’s time. Bhatt, who used to live in the now demolished Kathputli Colony in New Delhi, originally hails from Rajasthan. Remembering the stories he grew up listening, Bhatt tells us how the root of this art can be traced back to the era of Amar Singh Rathore (a seventeenth century king) “The performances at that time used to be a narrative of the king’s generosity and valour. They later underwent creative experimentation, taking up myriad new and unusual themes,” he says. 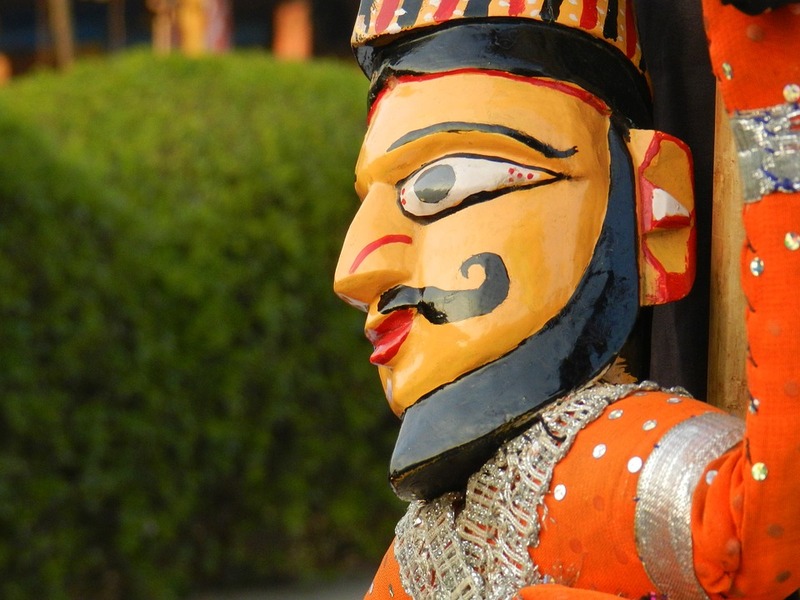 From being an all time favourite form of entertainment of the masses to an art that is staged only occasionally, the popularity of puppetry is visibly shrunk in India. “Earlier there was a lot more demand for the shows. Sadly, we are now called rarely, for occasions such as birthday parties or some traditional fairs,” says Bhatt. He states that with the advancements in technology and full package of entertainment bound to the smart screens, this change was bound to happen. With the wide array of tools of entertainment in today’s time, traditional art forms like string puppetry have taken a sideline. However, Bhatt claims that the use of this traditional art form to target the rural audience and sensitising them on social issues is in full swing these days. “I have myself performed a number of times for government projects such as the Beti Bachao Beti Padhao andolan,” he says. Throwing light on a rather interesting contrast and shift of preferences, Bhatt shares how Kathputli is being sought after much more by international audiences as compared to audiences in India. “The musical theatre of colourful dolls is a new concept abroad and so it is naturally evoking curiosity. A lot of us have been invited for international events sponsored by either government or private organisations. I have been to Dubai, Italy and, Holland for the same,” the artist says. An art and profession passed from one generation to other, puppetry may have a fuzzy future as the tradition of adapting family profession dies. Bhatt too won’t force his choices on his children but says that though the future generation is free to make a career in fields of their choice, they’ll always be attached to their roots. He has a strong belief that Kathputli will sail through the test of time, successfully.